This is one of the more popular hikes in the area. Every time I come here I am surprised by the number of vehicles in the parking lot. It is actually called the Pinguisibi Trail but most people know it as the Sand River trail. Located in Lake Superior Provincial Park this trail takes you along the Sand River past a series of cascading waterfalls. The trail has some steeper sections and some wet areas that can be slippery. The river and the falls look very different in the spring than in the fall, so be sure to visit more than once. Pinguisibi is the Ojibwa name for the Sand River (pingui – “fine white sand”; sibi – “river”). 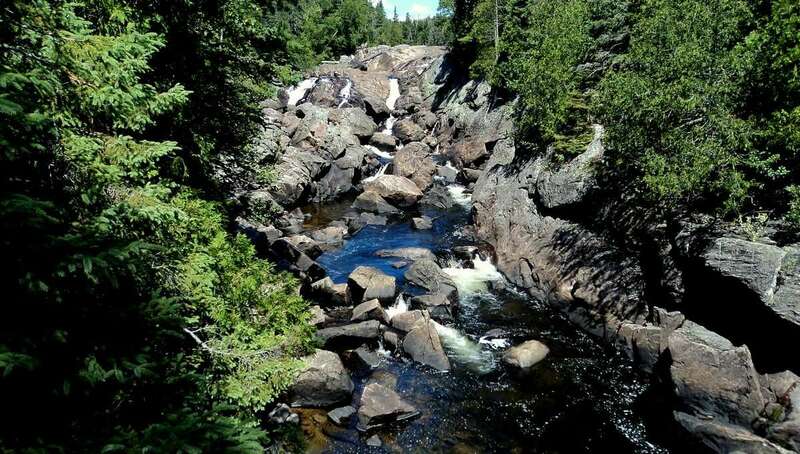 The Sand River was a route used by the ancient Ojibwa, who lived on the East shore of Lake Superior for at least 2,000 years, as they traveled between their winter camp inland and their summer camp near the shore. From Sault Ste. Marie, Ontario drive 150km north on hwy 17. You will see a sign for the turn-off into a parking area on the right. From the parking area follow the well-marked and well-used trail upstream. The trail ends after about 3km at Portage 28 of the Sand River Canoe Route. There is a small campsite at the turn-around for those who want to stay overnight and for paddlers who are making their way down the Sand River. Return to the parking are the way you came.